Here, coconut takes center stage: flakes brown lightly on the tops and the filling is flavored with coconut, too. 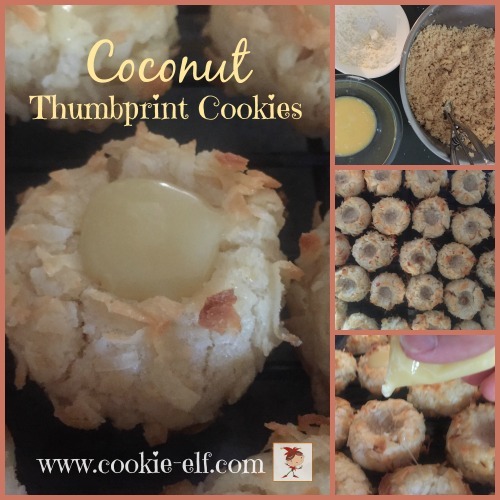 If you love coconut, you’ll love this recipe! Preheat oven to 350º F. Line baking sheets with parchment paper or silicone baking sheets. Set aside. In a small bowl, beat egg with 1-2 tablespoons water to make an egg wash. Set aside. Pour coconut into a small bowl. Set aside. In a medium bowl using an electric mixer on medium speed, cream butter and sugar until light and fluffy. Add vanilla; mix thoroughly. Fold in flour, mixing only until the dough begins to stick together in clumps. Scoop dough into large, marble-sized balls, a scant 1 inch in diameter with a cookie scoop or roll balls in between the palms of your hands until smooth. Dip balls into egg wash, roll them in coconut, and set on prepared baking pan, about 2 inches apart. Press your thumb or knuckle in the center of each ball, leaving a small well. Bake cookies 13-18 minutes until coconut browns lightly. Do not over bake. Cookies will set as they cool. Remove cookie trays from the oven. While cookies cool, mix filling. Break up baking chocolate into squares and place them in a quart-sized freezer bag. Add butter and corn syrup. Microwave 20 seconds on High. Massage sides of freezer bag to loosen chocolate and mix ingredients together. Add coconut extract. Repeat once to allow mixture to become melted and smooth. Clip off a corner of the freezer bag and pipe filling into the center of each cookie well. Allow filling to set. Store cookies in an airtight container with waxed paper between layers. It is better to press shallow wells than deep wells in cookies to prevent cracking. Cookie wells may rise during baking. If so, press your thumb or knuckle in the center of each well again, before cookies set, being careful since cookies may be hot. You can tint the filling with a drop or two of your favorite pastel color if you wish.